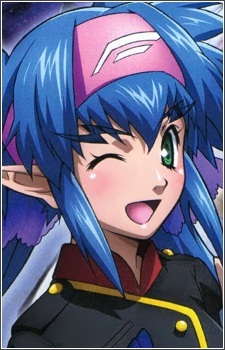 A blue-haired Zentradi female (Meltrandi) who is in command of the all-female S.M.S. Pixie Squadron, with the rank of captain. As a childhood friend of Michael Blanc, she actually harbors a crush on him that does not seem to be reciprocated until too late. She is also a top ace Queadluun-Reapower-armor pilot. Due to a certain genetic anomaly, she appears her age as a fully-developed Meltrandi while macronized, but becomes physically a juvenile in her micronian form. This makes her the perfect target for Michael's mockery. In episode 20 Klan Klang reveals her love to Michael in the heat of battle, only to watch helplessly from the macronization chamber how he dies trying to protect her. Michael's last words of confession prompts her to tell Alto to be honest with his feelings for Sheryl and Ranka, in the process revealing Sheryl's fatal infection to Alto. When the Macross Quarter deserts the Frontier fleet, Klan is one of those who stay behind, saluting the ship as it launches past her, and appears to be one few personnel of S.M.S. who stayed behind because she knew they would return. During the final battle, her Quaedluun-Rea is critically damaged by Brera Sterne, but she springs back into action in Michael's VF-25G while in micronized form, trumping her sniping skills. In the climatic confrontation with Grace, her VF is damaged while covering Alto, so she gives him Michael's sniper rifle, with which he defeats Grace in the end.